As any serious tennis player knows, investing in a high quality racquet can give your game a boost. Certainly, using the proper technique and your athletic ability play key roles in your results. But if you have a really good racquet, you’re going to be ahead of the game. Unfortunately, even the best racquet starts to wear out after a period of heavy use, just like any piece of equipment. But you can give your tennis racquet new life by restringing it. Tennis racquet strings stretch and lose their tension as you play. And they eventually need replacing. 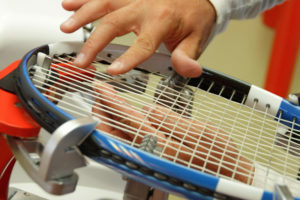 To receive the most benefit from your racquet, you’ll want to give your racquet a restringing on a regular basis. If you just wait to restring until the strings have become weak enough to break, it’s too late. Your game has been suffering from the worn out strings. You can take your racquet to a tennis pro shop for restringing. This can become an expensive proposition after a while though, especially if you play often enough to require a restringing every month or sooner. That’s where a tennis stringing machine enters the picture.